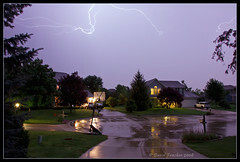 For the first time in a long time I tried my hand at capturing some lightning. I’ve tried very unsuccessfully in the past to get a lightning shot that I could be proud of but tonight was another story. We had yet another not so insignificant storm pass through the area tonight. At first I tried shooting through one of the west windows in our sunroom but by the time I got my camera set up most of the lightning had moved to the other side of the house. I moved my gear to an east facing dining room window but the screen and trees were causing other troubles. I was about to put everything away when I decided to move into the garage (also east facing). At first I wasn’t having much luck. I had been trying to limit my scope to one of the houses across the street (and the sky above it obviously) since I had been seeing a fair amount of activity in that general direction. After several unsuccessful attempts I changed my approach and zoomed back out to 18mm and widened my field to nearly the entire cul-de-sac. Immediately after repositioning and opening the shutter I was presented with a perfect flash that I knew was right across the top third of my frame. I left the shutter open for a few more seconds before closing it. When the review came up I took one look at it and said to myself “this is the shot I’ve been waiting for,” packed up my gear, and headed inside satisfied that I FINALLY got the lightning shot I’ve wanted since I got my D40. For anyone interested in the technical information about this shot, this was taken at f/8 for 23. seconds.